Thycotic makes it easy, fast and affordable with Secret Server. 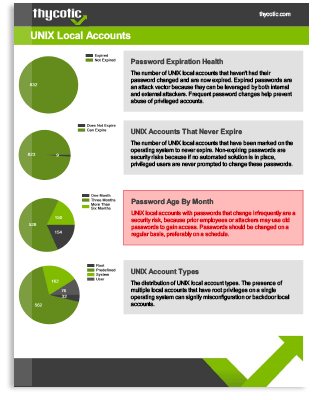 The report you got from the Free Privileged Account Discovery Tool gives you a comprehensive overview of all your privileged accounts—and highlights which ones are vulnerable. Take the next step now, by downloading a free trial or purchasing Thycotic Secret Server. What are the top 5 benefits you get by upgrading your Secret Server? Limits Windows privilege on servers and workstations with the Application Control Solution, providing flexible application whitelisting, blacklisting, and real time assessment for unknown applications. Talk to an Account Manager at +1 (202) 802-9399 or sales@thycotic.com. Windows Discovery Tool Installation Guide. Windows Discovery Tool online forums, moderated by Thycotic experts. UNIX Discovery Tool Installation Guide. UNIX Discovery Tool online forums, moderated by Thycotic experts. 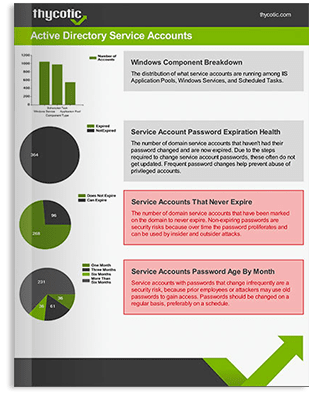 Get the fastest to deploy, easiest to use privileged access password security solution in this free edition that supports up to 100 users and protects up to 500 privileged account passwords.